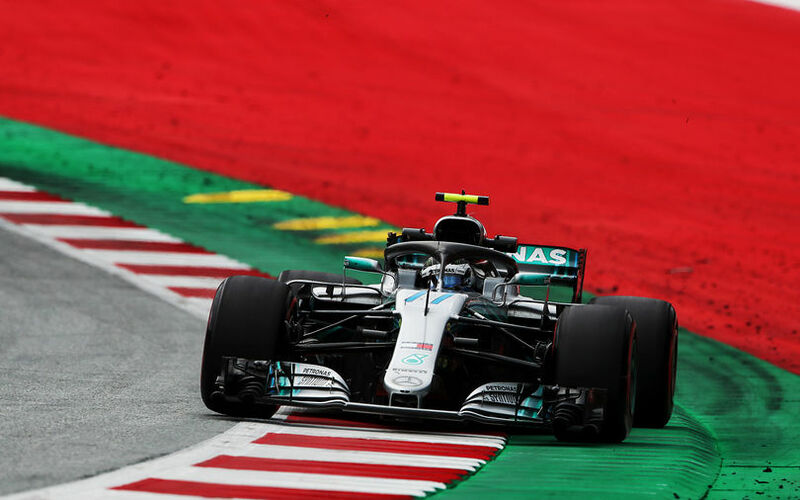 Valtteri Bottas will be on pole position for the Austrian Grand Prix after setting the fastest time in today's qualifying session. Lewis Hamilton was beaten by just 0.019s but secured a Mercedes front row start. The Ferrari duo will start from the second row. Despite the short circuit, it didn't last long for the big guns to arrive out on track. With the ultra softs needing a lap or two to get up to temperature, the Mercedes and Ferrari drivers all went for several consecutive flying laps, the second of which being the faster one for all four men. Red Bull only sent their cars out a bit later, but neither were able to really challenge the silver and red cars. It seemed though that Verstappen had the upper hand on his team mate. All were secure to go through quite rapidly thanks to these laps, along with both Haas cars. This left the battle to fight in the dropout area to the guys behind them. Q2 saw a similar story at the top of the field. The leading cars had no issues to set a competitive time straight out. Even Verstappen and Ricciardo, who opted for super soft tyres were well in the mix. Still, somewhat surprisingly, they all ended up out on track again, making the track more busy and complicated for others who really needed to set a time in the end. Sainz found out the hard way, as he was considerably blocked by Vettel who at the time was slowly going round on his way to the pits. But with Sainz charging, he was unable to accellerate out of Turn 3, since Vettel was on the racing line. An investigation was immediately announced. The end of Q2 saw 5 teams get both of their cars qualify for the top 10. Along with Mercedes, Ferrari, Red Bull and Haas, Renault's two cars qualified. But for Sainz, that was obviously thanks to an earlier flying lap. Alonso was among those who didn't make it to that top 10, losing everything in S3. There, the kerbs ruined his front wing as well after pushing a bit too hard with the struggling McLaren MCL33. A nose change seems necessary ahead of the race. In Q3, Mercedes and Ferrari were out quickly yet again. This time around, it was Bottas who was fastest, setting a new track record in 1:03.264. Hamilton followed up in second, but was no match to his team mate due to braking a bit late in Turn 3. The early laps weren't all the impressive anyway, as Grosjean later managed to get into 4th and both Red Bulls also slotting in ahead of Vettel, Magnusen and both Renaults. On the second and final runs, Bottas further improved and took pole, although just 0.019s ahead of team mate Lewis Hamilton. Vettel led Ferrari in third, 2 tenths faster than Raikkonen who takes 4th.